Marlene Sai, left, and Genoa Keawe are all smiles during the singing of Hawaii Aloha at the 2003 Na Hoku Awards. Genoa Keawe was as talented as she was approachable, a singer whose smile and ability to hold onto a high note never faltered with age, friends and fans said yesterday in reaction to the death of the musician they called "Aunty." "She was always cherishable. I've never seen her mad," said friend and music producer Kata Maduli. "She was a gem. 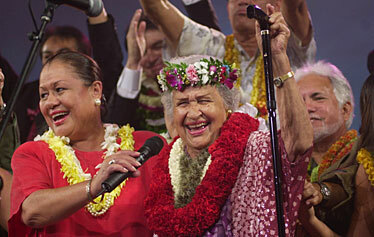 She is a huge legacy for Hawaiian music and entertainment." It was a sentiment echoed by elected officials as well as family, friends and fans from California to Las Vegas and Colorado to Boston who flocked to Keawe's Web site to thank her for her songs, for "always being there" and to wish her well in her journey to "sing in a higher and better place." Wanda Certo of Cleveland said she discovered Keawe after listening to the late Israel "Iz" Kamakawiwo'ole and embarking on a search of Hawaiian talents. "Both my husband and I fell in love with the music and wanted to learn more and hear more. Naturally, this search lead to Aunty Genoa," she wrote in an e-mail. Certo, a 55-year-old retired federal government worker, said she was amazed with how accessible Keawe was when she saw her perform in May. "She was happy to talk story, happy to play a song request and happy to have pictures taken," she said. "And at 89, boy, could she sing!" Keawe died yesterday morning of health complications, according to her family. Honolulu Mayor Mufi Hannemann said he first heard Keawe sing when he was a young boy attending the Church of Jesus Christ of Latter-day Saints. In December 2005, shortly after he took office, Hannemann declared a day honoring Keawe. Hannemann said he visited Keawe about a week ago, and she wanted to know how he was "holding up." "This is typical Aunty Genoa. It is never about her. She was asking me how I was holding up, how my family was doing, as she lay in her bed," he said. "That's why she was so loved, and she will be missed." In a statement, Lt. Gov. James "Duke" Aiona said "Hawaii has lost a beloved icon." "Her deep commitment to mentoring Hawaiian musicians and perpetuating the Hawaiian culture is an inspiration to us all and will continue to inspire future generations," he said. Maduli, who owns Mt. Kalihi Productions Inc. and described Keawe as "a mentor," said she once sang at his mother's funeral shortly after they arrived from a 1987 trip to Russia with a group of Hawaii entertainers. While in Moscow, Keawe, after seeing that Maduli had brought poi to feed the crew, immediately took off her shoes and began dancing on top of the plastic bag to mix the food, Maduli recalled. 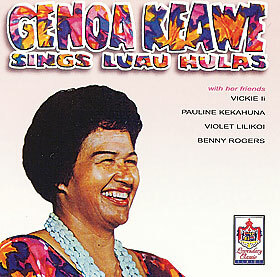 Keawe's falsetto skills remained spotless even as she got older. Strumming her ukulele, she could keep a high note going for several seconds without losing her breath, especially when she sang "Alika." Those skills fascinated Alex Krauth, a high school student in York, Maine, who can do her own version of the song. "I just loved the fact that she could still hit all those high notes at her age," Krauth said. "When I started listening to it, I used to not really be a big fan of falsetto, but now I am. I think it was hearing 'Alika' that made me just feel like, 'Oh, my God. Wow.'"